Help! My kitten has diarrhea. What should I do? Kitten diarrhea shouldn't be taken lightly. It's worrying, of course (not to mention messy) and can be life-threatening. So if you're in any doubt at all, contact your vet for advice. Let's take a look at some of the causes and treatment of diarrhea in kittens. Kittens and young cats are easily affected by loose stools – their digestive systems are still developing and they get stomach upsets and 'the runs' much more quickly than adult cats. It's important to take this seriously if there are any other signs of illness like vomiting, sluggishness, or dull, glazed eyes, and especially if your pet has stopped drinking any water. Diarrhea can lead to kittens becoming dehydrated. If this becomes severe it will, at best, need veterinary treatment, and at worst, might lead to the death of your cat. One way of looking for dehydration is to pinch the skin at the base of the neck. If the skin doesn't spring back right away, your cat is dehydrated. The causes of diarrhea in kittens are many, from a simple change of environment or overfeeding, to major diseases like feline leukaemia or panleukopaenia. So diarrhea in a kitten could be the result of a minor stomach upset or a much more serious problem, and you'll need to look carefully at what else is going on. Taking a good look at what's coming out of your kitten's rear end can tell you a lot about what's going on inside. Perfect poop is brown with a slightly soft-to-firm texture. It should not be watery and ideally, should consist of one long 'sausage'. Individual little balls looking like rabbit droppings can mean that your cat needs more fluid in his diet. Greenish, or white like cottage cheese. May mean that you're overfeeding, or the food isn't being digested properly. Watery, gray and runny. May indicate a bacterial infection – take your kitty to the vet. Yellow with clear mucus, foul-smelling. Again, a sign of infection - contact your vet. Black or bloody. Kitten diarrhea with bloody stools – any sign of blood, in fact, could indicate a number of things, all of them potentially serious. Go to the vet immediately. Treating diarrhea in kittens is best left to an expert unless you're sure that the problem has been caused by a simple case of overfeeding. But there are some things you can do. Don't leave your kitten unattended. Please don't go off to work thinking that everything will be all right. Kittens can go downhill very quickly. Make sure your kitten is drinking. Watch to make sure that some water is going in. Keep your kitten clean. The acidity of loose stools can harm a kitten's skin. Gently sponge its bottom and legs using a cloth and warm water, and pat dry afterwards. If you're absolutely certain that overfeeding or stress has caused the problem, adding a spoonful of cooked, mashed pumpkin to your kitten's next feed may help. Should a kitten be vaccinated while it has diarrhea? Probably not. Kittens should really be vaccinated when they're at their most healthy, so vaccinating a kitten with diarrhea isn't really a good idea. It's best to discuss this with your vet, though, so that you can consider all the implications. 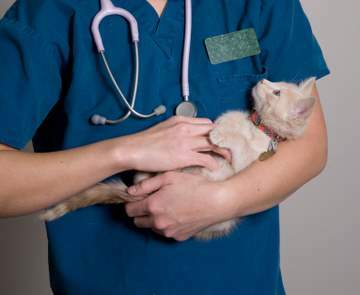 Kitten diarrhea may be serious, so keep a watchful eye on your kitten and take it to the vet if you are in any doubt.